Although the cycling is over, we had a day full of planned activities. We started with a visit to the Antonio Nuñez Jimenez Museum. Nuñez Jimenez was a revolutionary who fought under Che Guevarra, and an academic who was a prolific writer, an explorer, and a collector of a wide range of artifacts. The museum was fascinating. Following the museum visit, we went to lunch as a group. We had good bread for a change. Our appetizers included octopus, ceviche, croquettes, eggplant and fried plantains filled with cheese. We had a choice of several grilled entrees – I had the excellent pork chops. Others had sea bass which they said was also delicious. We were on our own for the afternoon, and then regrouped around five for a reprise of the vintage car ride through Havana (for the benefit of the cyclists who joined us the second week). We took a different route this time, so we saw different parts of the city. The car that I was in was a yellow 1958 Pontiac that had been featured (so the owner told us) in the Hemingway movie, “Papa.” He played early Beatles music on the car stereo as we cruised the city. 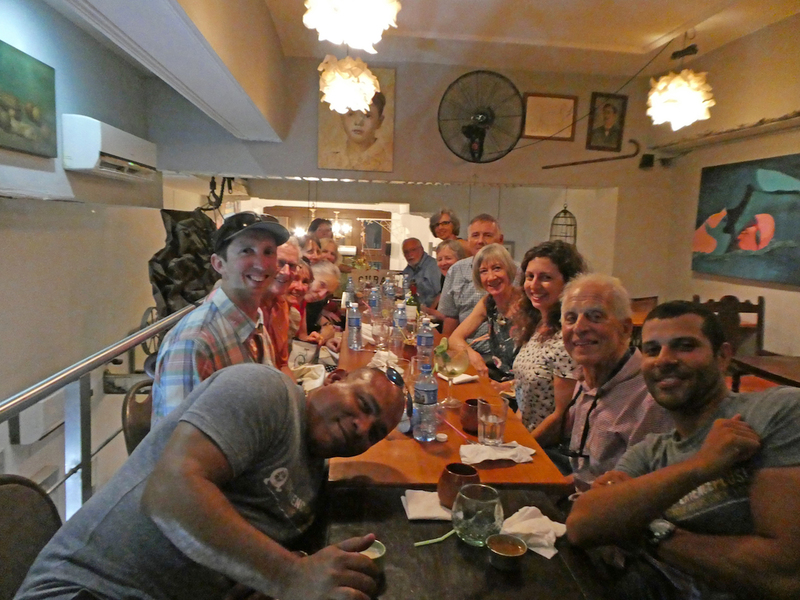 We then walked through a portion of Havana Vieja to a small restaurant where we had our farewell dinner. Unexpectedly, our waiter was wearing winter gloves and sporting a rather obscene t-shirt. Back to the hotel for a final drink on the veranda where we listened to a small but energetic group of musicians playing as some of the patrons danced. Even our waitress got into the act, dancing to the tables while balancing drinks, and then joining the band with some form of percussion instrument (a gourd?) that I did not recognize. I spent the morning with a leisurely breakfast, packing, and a final email check before riding to the airport in a taxi with Nancy and Aylan. Check-in was orderly and quick; security much less so. I exchanged my remaining CUCs for Euros and waited for the plane. I noticed that a flight to New York, scheduled to leave about the same time as our flight to Charlotte, was cancelled. I hope that it did not affect any of our group who were heading to or through New York. Two uneventful flights brought me to San Francisco just aft 11 pm, so it was early Monday when I walked in the front door. In 10 days of cycling, I pedaled 300 miles, seeing all the variety that central and western Cuba has to offer. 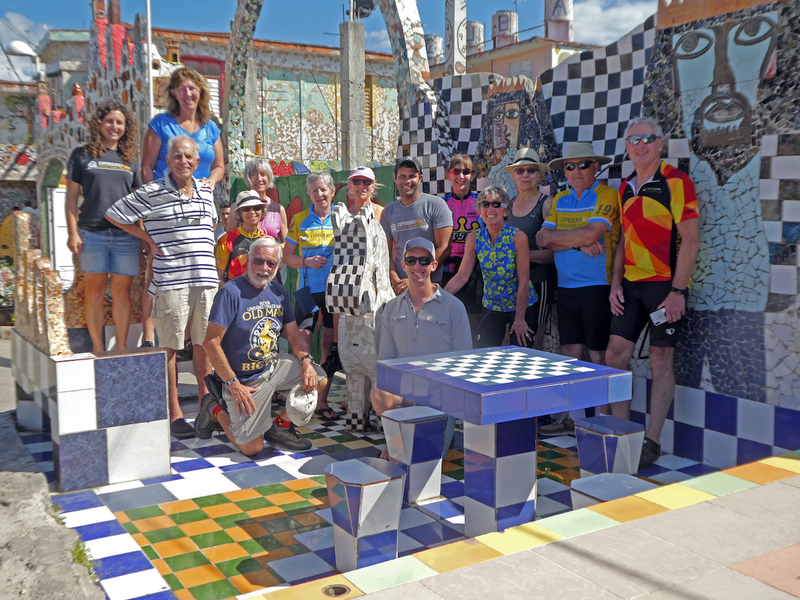 The trip was full of surprises, shared with a fantastic group of guides and fellow cyclists, and one to be remembered fondly for a long time. 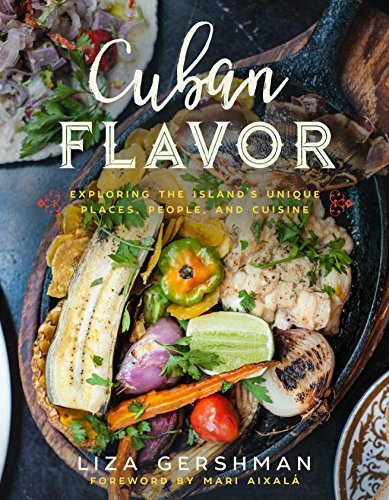 Awaiting me upon my arrival at home was a copy of Liza Gershman’s new book “Cuban Flavor – Exploring the Island’s Unique Places, People, and Cuisine.” I am looking forward to perusing this book given to me by my daughter-in-law, and friend of the author, Carol Morganstern Cunningham. Today is billed as a rest day, but that only means that we will not be cycling. We shuttle through Viñales to the spot where we will begin our hike in the national park. Along the way, we stop to drop off laundry with a contact of Alex. Another Magote -- "Coco Solo"
We begin the hike along a dirt road and pass all manner of vehicles including wooden sleds pulled by oxen, horses with tourists aboard, motor scooters and taxis. Our first stop was another tobacco farm, much smaller than the one we saw yesterday. The farmer has a maximum of five employees, but usually manages with only two. We had similar demonstrations to those of yesterday, but on a smaller scale. This farmer, like others in private enterprise, is obligated to provide 95% of his production to the government. He can keep 5% for “personal use,” meaning that he can sell his hand-rolled cigars to tourists like us. There is some confusion in what we are being told – does the farmer have to give 95% or 98% to the government? It doesn’t really make a difference – 95+5, and 98+5, both equal 100% according to the math of the region. The farmer will get his 5%. I bought ten of this farmer’s cigars, primarily to help him, rather than to acquire cigars that I will not smoke. I am sure that I will find friends that will be happy to have one. Our host was also selling coffee beans from his farm. After leaving the farm, we hike through some terrain that was a little more rugged and arrived at an organic farm where we had lunch. We began with piña coladas, with the bottle of rum passed down the table to be added as desired. Then we had an excellent soup, followed by the best pork and chicken so far this trip. There were also deep-fried chunks of tuna which were not to my taste. After lunch, Alex guided us around the farm. We learned that banana trees produce only one bunch per year. After harvest, they are cut off about a foot from the ground. The following year they will grow to full size producing one more bunch. On the way back to the hotel we picked up our laundry. My bill was only $5.40 for a few days worth of clothes. Should not have to do any more this trip. We return to the hotel. They have money today, so I exchange more than I expect to need for the balance of the trip. The surplus can be used as part of the tip for the guides, or can be exchanged at the airport. The big surprise of the day is that the WiFi is sufficiently strong that I can make an internet phone call to Kathleen. Happy Valentine’s Day! Up until now, the WiFi has been adequate for email and internet browsing, but not good enough to support VOIP phone calls. We meet at six to drink some wine that Lisa has had stored on the bus for a few days. Dinner is on our own this evening. A few people wander back into Viñales (for pizza, as it turns out), but I and several others eat at the hotel. The buffet-style dinner is included in the price of our room.